Business Hours: 12.00pm to 10.30pm. SHOGUN by Saisaki opened its doors in the heart of metropolitan Kuala Lumpur on Aug 5 and from the looks of it, it will gain a steadfast reputation among the urban crowd sooner that one can imagine. Located at the ground floor of Fahrenheit88, an upcoming mall in Jalan Bukit Bintang, Shogun by Saisaki has much to offer for those who not only love Japanese, but also Chinese and Western. Nested on the ground floor of the trendy mall, Shogun offers a comfortable yet sophisticated atmosphere, luscious variety of food and a selection of Japanese wines for the discerning diners. Being the fourth outlet in the Klang Valley, the person responsible for the mouth-watering buffet is chef Tamby Shah who has 18 years of experience in Japanese culinary. Tamby has been with Shogun since it started in 1999 and now with the launching of its fourth outlet, he expressed that he was energised to face exciting challenges far ahead. Tamby summarised that every dish has its complexities and he strongly recommends that we try everything from Japanese to the sumptuous Chinese soups and dim sum, to the western lamb shank and beef tail. “We have 200 different varieties in the buffet, out of which 80 are sushi selections and 40 varieties of maki. Diners should try the raw oysters, ‘Buddha’ soup or famously known as ‘Buddha Jump over the Wall’, black mussels, lamb shank and beef tail,” he said. Among other sumptuous looking varieties featured at the buffet were crab stick salad, cold tofu, yaki udon, red snapper head, yaki tori, seafood nabe, chawan mushi, black mussels served with French beans and Sanma fish. 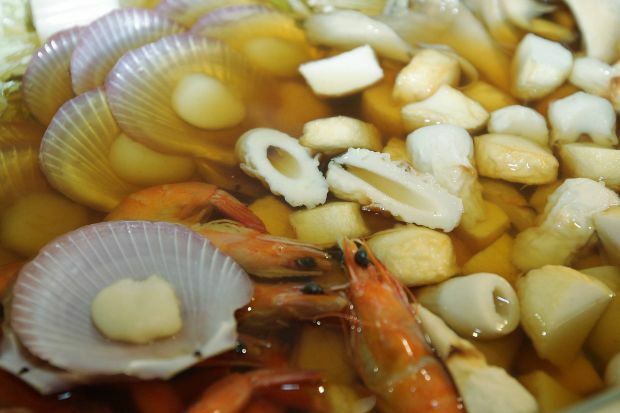 The restaurant also has a teppanyaki corner for those who love fried food and the main ingredients are noodles, clams, squid and a variety of vegetables. 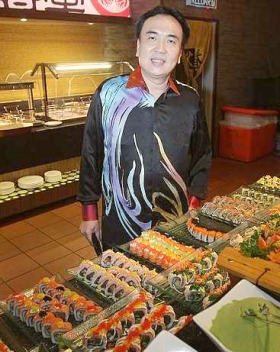 The owner: Datuk Michael Chong showing the different varieties of maki at a counter. In addition to the above, Shogun by Saisaki also serves Western and Chinese delicacies. The lamb shank and beef tail are a must try since they are prepared in such perfect manner. Meanwhile, the dim sum was an added value to the buffet not forgetting the special lobster dish, which is known to be one of Tamby’s best creation. Finally, the dessert corner, which everyone would not miss for the world. The chocolate mousse cake is a piece that would leave you yearning for more. These are your melting moments as the dessert just gives a smooth texture that melts in your mouth, giving you that lingering chocolaty taste. Other tantalising varieties include cheese cake, strawberry mousse, some Japanese favourites, fruits and dates. Shogun was established in 1999 and it is the first Japanese buffet restaurant in Malaysia. Sub­sequently, two more outlets were opened in 2005 and 2007 in 1Utama Shopping Centre and Sunway Pyramid, respectively. Buffet lunch is priced at RM37.70++ (from Mondays to Fridays), while on Saturdays, it is priced at RM47.85++ and Sunday RM54.25++. The price for high-tea is RM32.30++ (from Mondays to Fridays) and RM41.50++ on Saturdays and Sundays. As for buffet dinner, it is priced at RM44.70++ (from Mondays to Thursdays), RM54.25++ on Fridays and Saturdays and RM47.85++ on Sundays.